Since I'm retired, Mondays are not the dreaded first day of the work week as they once were. And to be honest, I never hated them that much. As much as anything, I played along with the idea of Monday being such an awful day... something to jokingly complain about at work. And of course this particular Monday is a Holiday here in the US, celebrating the live and achievements, and the memory of Dr. Martin Luthor King. Yesterday was a lazy day for me. I didn't even turn the computer on, although I did occasionally check e-mail via my phone or tablet, and I messed with Twitter a bit on the tablet. Watched both NFL Championship games and pretty much lived in front of the TV for the day. Both games were exciting and both ended up going into over time, and there were a couple controversial calls or non-calls. As it ended up I was 0 for 2 for the day with both teams I was rooting for loosing. As mentioned in Friday's post, I finished reading the Hornblower stories earlier that day. I'd thought about going into the Master and Commander series again but want to wait awhile before reading an entire series. So I found the book I won at one of the last SASP meetings and started it. It's called Killing Floor: A Jack Reacher Novel and is by Lee Child. Modern day police, crime, thriller, I guess you'd call it. A completely different type of story from the Hornblower books. So far it's a fast paced read and I'm enjoying it. If you've paid attention over the years to what I've been reading, you've probably noticed I try to read a variety of genres and types of books, both fiction and non-fiction. While I prefer certain kinds of stories, I often find great reads in those categories I don't normally read or prefer. As a writer, I sometimes find ideas for my stories in books that are totally unrelated to what I write. Just saying because it kind of urks me to see people say they only read one specific genre and sometimes won't read anything in even a closely related genre. Finally I hope everyone got to see and experience last night's lunar eclipse/blood moon, etc. We didn't have a completely clear sky for it, but the clouds thinned out enough where we could see it. Here the pic I got of it. In the original it was just a small point of light but I cropped it to make it (the moon) bigger. Of course when doing so, the picture becomes more coarse and less focused. Still, not all that bad for a cell phone camera. I've seen a telephoto lense attachment that you can get for a cell phone so maybe one of these days I'll see if I can find one. 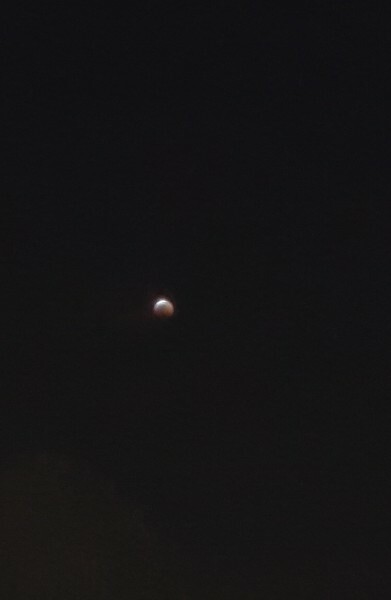 When I took the pic, the eclipse was not quite into totality, just a touch not in shadow showing at about 11 o'clock. I tried to get a pic later when it was about half out of the shadow but the lit up portion was too bright and all I got was a big bright blur. Tried twice and decided it wasn't going to work. Saturday evening got a start on Chapter Twenty-Two of Darnahsian Pirates, and got about four to four and a half pages into it.